As Ahmed Shah Zahiri unfurls one of his intricately woven Oriental carpets, he does so with the same dexterity and pride that his grandfather exhibited nearly a century ago. 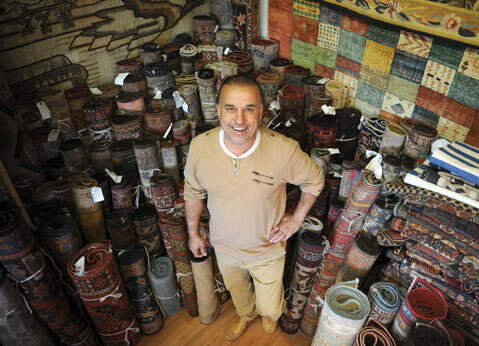 Though his perch overlooking the Pacific is 7,500 miles from his native Kabul, his Summerland carpet emporium maintains a level of craftsmanship that has survived war and dislocation. “Shaw,” as he is widely known, fled Afghanistan with his two younger brothers in 1983 at the behest of their mother who feared her sons would be forced into the Soviet-backed military. The boys escaped into Pakistan, clambering over mountains and rugged terrain at night, hiding from the militia during the day. The young refugees remained in Pakistan for almost two years, waiting for papers from their eldest brother who had already established himself in America. It was a difficult time for the young Shaw — he was constantly harassed by the Mujahideen, the resistance movement against the pro-Soviet Democratic Republic of Afghanistan — but he kept out of sight and watched over his siblings. Shaw, his long hair pulled back into a ponytail, has an easy smile and warm demeanor. He has been in the Santa Barbara area for almost 30 years now, along with many of his family members, who emigrated as well, and the family he has raised here. After perfecting his English at S.B. City College, he began his carpet business, starting small and working hard. His clientele began to grow along with his reputation, and he soon became known as a scrupulous expert in the trade, establishing trust with customers who return with repeat business. The carpets are from all over the world; hand-made of silk, wool and cotton; and so exquisitely crafted that some have survived for hundreds of years. As Shaw put it, they are “art on the floor” (though there is a growing trend of hanging them on the wall), one-of-a-kind pieces that become family heirlooms. The rugs are typically identified by the city or region they come from and tend to have distinct characteristics of color and design, like the medallions of the Oushak or the florals of the Isfahan. Each rug takes up to three months to create, and many of them have slight imperfections that only add to their artistry and authenticity. Shaw’s range of inventory is impressive: His rugs vary from 17th-century Persian silks to fairly new Turkish wools, from a value of $100 to more than $100,000. Although he compliments the new rugs’ attractiveness, he is most reverential when talking about the age of the carpets, the living history that is imbued in so many of the pieces. Compact and muscular (his other love is soccer; he plays weekly), Shaw easily hefts carpets weighing upward of 50-100 pounds. He wants his customers to be happy, to love their purchases. Based on their preference for size and color, he allows his clients to take home their selection before purchasing it, to ensure that it’s a match. Summerland Oriental Rugs, 2350 Lillie Ave., Summerland. Call 565-7998 or email shaw2zahiri@yahoo.com.